Apple’s newly-released iPhone SDK 3.2 beta has an interesting new reference to “multitasking dialog box,” a new feature of “Apex” (possibly iPhone OS 4.0?) that suggests users might finally be able to multitask with third party apps (currently only Apple’s apps like the iPod and email apps can multitask). This could be an iPad-specific feature, or it could just be referring to a method for managing Apple’s stock apps. 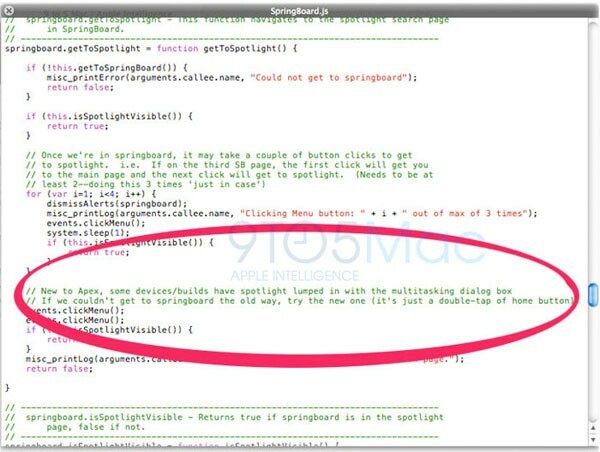 The text says “some devices have spotlight [the search feature] lumped in with the multitasking dialog box,” followed by a reference to a new way to get back to the iPhone springboard (home screen), by double-tapping the home screen. Currently double-tapping brings up the iPod controls.